There has never been a better time than 2019 to be looking for GMC trucks for sale in your area. Having been a reputable truck manufacturer for over 100 years in the United States, GMC has built upon their years of innovation and success to provide a new lineup that is bound to impress even the most skeptical lover of pickups. This article will take an in-depth look at a wide variety of the pickups available in GMC’s 2019 lineup. From smaller and sporty, to true full-size workhorses, GMC really has made an effort to provide something for every kind of pickup owner. The GMC Canyon is immediately recognizable from its counterparts due to its distinct finishes and sharp overall aesthetic. The rugged and stylish design effortlessly crosses the gap between a flashy roadster and a seasoned workhorse. The chrome accents, signature LED front lighting integrated cornerstep rear bumper and four-door cab make this model both attractive and functional. The Canyon’s cabin also features noise-reducing innovations such as triple door seals, and available heated driver and front passenger seats. In terms of safety, the Canyon truly excels. Its driver alert technologies provide collision-avoidance in a variety of different situations. From lane departure warnings to forward collision alerts, the technology in this vehicle will help keep you alert and safe on the road at all times. True to the GMC name, the Canyon makes no compromises when it comes to raw power and performance. Powered by either the 2.5L 4-cylinder gas engine, 3.6L V6 gas engine or the available Duramax diesel engine, the Canyon will pack a mighty and efficient punch regardless. With its Stabilitrak traction control, trailer sway and hill start assist, automatic rear locking differential and Duralife brake rotors, the Canyon will deliver its 308 horsepower in a safe and affordable package. The first thing you will notice about the new Sierra 1500 is its reworked aesthetic and design. From its reshaped signature grille, taller hood design, available chrome accents, improved wheel stance, and increased cab size, the next generation of Sierra isn’t shy about making changes. The Sierra lineup also offers a variety of wheel options such as 20-inch black wheels and a choice of either 18-inch machined aluminum wheels with metallic accents, or 20-inch polished aluminum wheels. Moving to the inside of the truck, the Sierra 1500 boasts a number of interior features that put the driver first. Its carefully-aid interior lighting, ergonomically- placed controls and buttons and chrome trim accents are all there to help make the time in your GMC as pleasant and convenient as possible. You can also choose from a number of interior storage options to best suit your individual needs. Rear under-seat storage, a lighted center console with available lockbox, available rear-seat center cupholders and more are available to help you keep everything organized while getting from A to B. While the Sierra 1500 is referred to as a light pickup truck in the GMC catalog, it’s important not to let this distinction fool you. The 1500 model is capable of offering up to 420 horsepower with its 6.2LEcoTec3 V8, towing up to 12,500 lbs, and doing it all while getting 24 MPG highway. This classic package packs a punch across the board and looks good while doing it. The 2019 Sierra 1500 Denali is fit especially for the buyers who like the design and performance of the 1500 Sierra but are looking for just a little bit more zip. This premium model offers up to 420 horsepower and the ability to tow up to 9,600 pounds; not too shabby. The Denali features a largely reworked exterior that presents an air of luxury and performance. Its seamless surround side-windows integrated dual exhaust, and practical vertical recovery hooks are just a few of the features that set this truck apart from the competition in both appearance and usefulness. 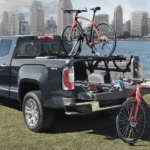 One of the standout features of the Denali is the new Multipro tailgate, the world’s most innovative and versatile pickup tailgate yet. Its six distinct states of the flatbed provide everything from a flat work surface to a step, allowing easy access to your cargo. Coupled with the improved lighting and overall durability, GMC’s Multipro tailgate will completely change your expectations of what a pickup truck is capable of. The Denali’s interior makes a strong effort to provide luxury in every trim and stitch. The open-pore ash wood trim, premium forge leather-appointed seating and the unique seat-sew and stitching style will truly immerse you in the luxury vehicle experience. And with 10-way power-adjustable seats that include heating and ventilation, you will be riding in comfort at all times. The increased cab size of the Denali allows for more head and leg room than ever before. Also, for your passengers in the back seat, there is an abundance of leg room. Paired with the larger rear-door openings, your guests will be more comfortable than ever. The last topic that really begs mentioning is the Denali’s raw power and capability. Its standard 5.3L V8 with dynamic fuel management offers up to 355 horsepower and 383 lb-ft of torque. Depending on if you want just a little more power, the Denali also offers an available 6.2L v8 with 10-speed automatic transmission, and a 3.0L Duramax Turbo Diesel inline 6-cylinder paired with a 10-speed automatic transmission. For the truck owner that requires both style and substance, they need look no further than this. Now for just a little bit more fun before we stop talking trucks, let’s take a look at the Sierra 3500HD. This pickup model is the ultimate in commercially available power and performance in a GMC truck. With a maximum capability of 445 horsepower, the 3500 Denali HD is capable of towing up to 23,100 lbs (that’s nearly 12 tons) and carrying a max payload of over 6,000 lbs. The 3500 HD accomplishes these incredible feats of strength through the help of GMC’s standard Vortec 6.0L Variable Valve timing v8 SFI engine. This feat of modern engineering provides the smoothest shifting and overall ride possible while still outputting an unprecedented level of power. And even with all that incredible power under the hood, the 3500HD understands full well that power only means so much if you can’t deliver it in impeccable style. Featuring available premium trailering side mirrors, a chrome grille, and HID projector headlamps, the 3500HD ensures that no head will go unturned while you go about your daily work. Starting at $56,600, this truck may not be on any bargain lists, but if you need something that will stand up to the absolute heaviest jobs you can throw at it, this may be the one true answer. As we covered before, GMC has been at this game for a long time. They’ve been designing trucks and shaping our country’s very culture for decades. GMC brings visionary ideas to car design and implements them in a way that makes cars better, safer and just plain better looking. And now that we’ve taken a look at the latest offerings from this historic company, it’s time to visit your local dealership and see what GMC trucks are for sale near you.